After having done many visits over south india to the east, my family expressed a desire to visit the western coastal areas of India either in Karnataka or Kerala. 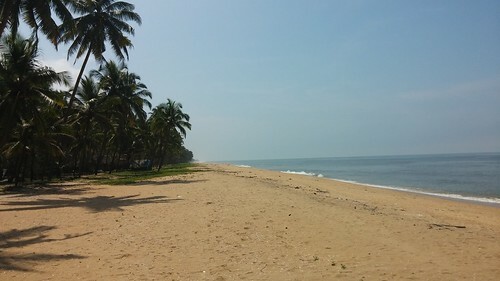 So I looked up tripadvisor and found Bekal and Kasaragod which were two areas that offered beach properties for holidaying. After looking at the reviews, I chose Nileshwar and adjoining areas for a decent resort. Most of the reviews indicated that Malabar beach front resort and spa was the place to go to considering the value for money proposition. 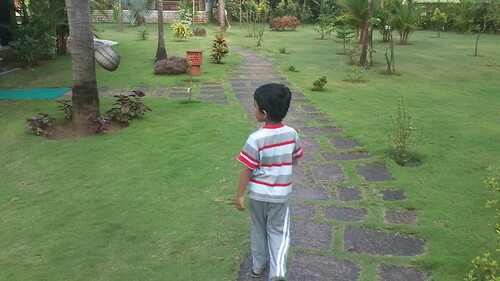 Some did say Nileshwar hermitage and Kannan Resort were also good, but I decided for Malabar instead. There is an earlier report on how not to do a journey to this place which you can read here if you’d like to. 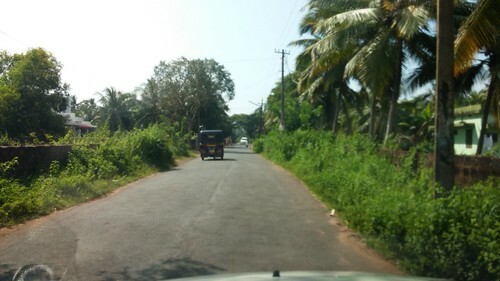 We reached Kanhangad (pronounced kaa-nyan-gaad) which is roughly about a couple of hours from Mangalore junction railway station. The train ride from Mangalore gets pretty interesting as we proceed towards this place as the scenic regions of Kerala are a treat to watch. 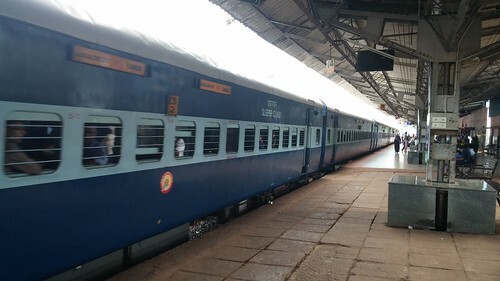 We reached Kanhangad railway station after an overnight train journey roughly by about 10am which is more or less the perfect time for both adults and kids to feel refreshed enough to disembark after a rather long train journey. Our cab arranged by resort was ready and waiting for us at the station. The resort itself was about a fifteen minute journey and just outside the town towards the village areas. My family was warmly welcomed by the people at the reception including the manager. We were offered a welcome drink and my kids started to get adjusted to the place as such within a short time. We found the usual Kerala style of construction of the resort which was no surprise after our earlier honeymoon trip to Punnamada, Kerala a decade ago. Our rooms were just after the restaurant area and these rooms were like villaments with two floors of staying areas for multiple families. The rooms themselves were pretty equipped though not to the standards of other bigger resorts we know of. But it was adequate for us to settle down. The beds, tables, sofas, and toilet facilities with wardrobes were all in plenty and there was enough room for a family of four to play around the room. The piece of the cake in this whole arrangement was the balcony, which would offer a fantastic view of the ocean front, and would also lead you to it every time you wanted to sit by the sea. Of all the properties I have visited which were supposed to offer a by the sea experience, this was one of the resorts which was practically right next to the sea shore. This is a perfect place to play around for the kids, and you can keep walking to the sea as many times as you want in full privacy that the resort offers. 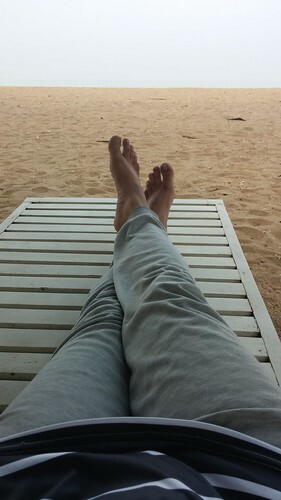 Its just you and the sea - and its that private. Full paisa vasool. The restaurant is large and airy and there would be many items on offer for food. However since this is a small resort and hence the team of cooks call you and let you know what is available for breakfast and lunch. There is not much of choice really unlike some other bigger resorts which offer buffet meals, but I guess that is also to do with the occupancy rate. 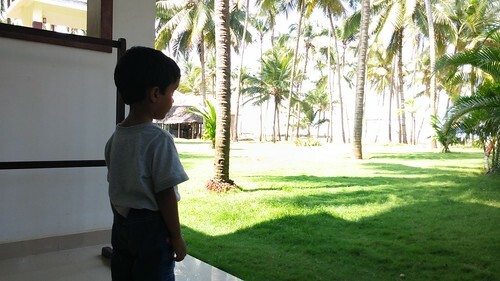 During the time of our stay, we were the only family which was occupying the entire resort, so the meal plans had to be only for us which is why the crunch. This was not a big bother for me, so I was at home with this kind of arrangement. The dishes themselves were limited to either Kerala style dishes, or standard fare like sandwiches, etc. Pricing was not a concern, though it was slightly on the higher side but variety was a huge concern for me. Thankfully they did have Appam, Phulka and the likes which was the kind of stuff kids could eat so it did not create much flutter for me. Definitely though the dishes and the menu itself can be made better for the money charged. Which by the way was about 5000 per room per day during off season occupancy (end september). Next up is the swimming pool. These guys have a large pool with a kids pool as well. They have lots of poolside tables, sprinklers, and good amount of towels to dry yourself. All professional enough for a great experience. I am not a swimmer myself, but my kids enjoyed being in the pool. There are lots of crows around the resort since well, its Kerala and its got hundreds of coconut trees and its by the beach, and these birds are a concern while people sit in the restaurant. There is nothing much that can be done about it except that the staff have put in a huge mesh around the place to keep the prying birds away. Further there is also free Wi-Fi in the resort, which gets switched off for some unknown reason in the night. Only the manager can say why! Same is the issue with hot water and it was a concern to us, since we got hot water only after multiple requests and due to an issue with the solar water heating which had conked out and had to be repaired. Getting manual labour to rectify these things is a concern in Kerala and this was no different case either. However the manager was pretty sympathetic to my requests which were a complaint on non functioning WiFi to a wrongly made Dosa, to no hot water and to a request to get me some medicine urgently to attend to my son having a viral fever while in the resort. Attitude cannot replace actual faults but atleast the management was willing to listen and admit to the complaints. Hopefully they would work on it to make this a better place. There is a watch tower from where you can climb up and get a unobstructed view of the beach and fishing boats plying around and its fun to spend time there. Its not a neat place though so you must watch what you step on. It can be dangerous for kids to go up there alone, so keep a watchful eye. 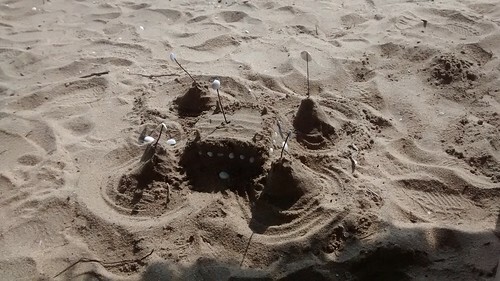 As for the beach access, there is a security placed there at all times, though he is only more of a security than a beach attendant. Going deep into sea waters is not policed and its upto you to maintain your limits of having fun. 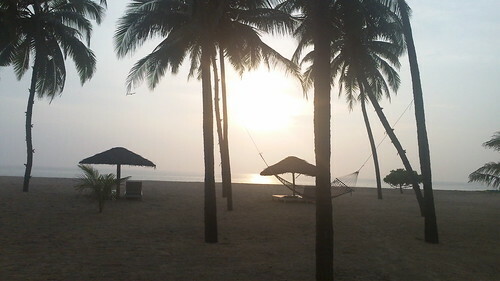 From where the resort limits end to the sea shore is a short one minute walk, and there are hammocks and by the sea basking furniture which are a nice touch. Once you step onto the seashore the fun awaits and you are seriously one with nature. The kind of fatigue reduction the sea can offer you is unparalleled and I can bet on the fact that this alone is worth the money you pay. Pristine sunrises, warm sunsets and scorching hot afternoons - every part of the day is just worth it when all you have to do is sleep, eat, build castles in the sand, and play in the water. 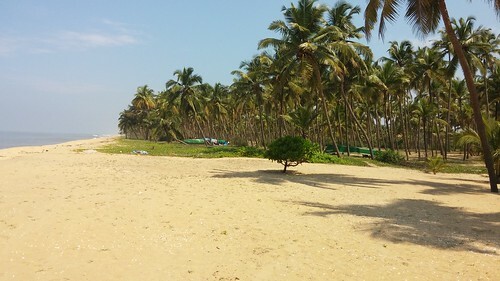 Two days is all you can really enjoy this and there is nothing beyond this nearby except if you decide to go out of Kanhangad to places like Bekal which are again beach fronts of their own. 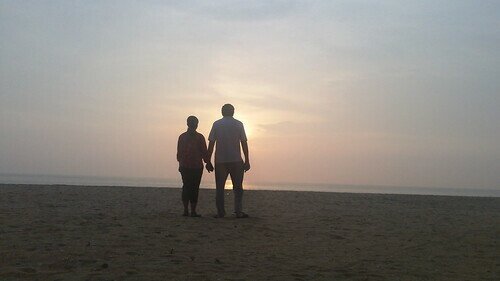 Our reason was to get out of the maddening city crowd of Bangalore and enjoy the calm sea shores of Kerala. And this resort provided exactly that requirement. There are some negatives considering the cost like the food variety, etc - but overall this place is neither lovable nor can you hate it so much. 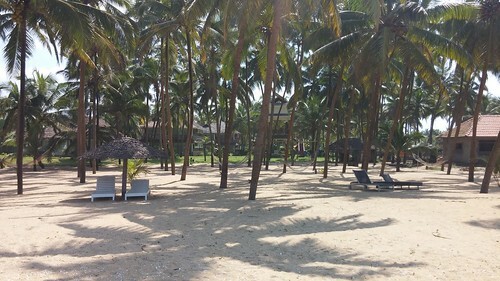 Its a perfect offering of sea front cottages, which at best keep you happy and occupied. You are really one with nature. The resort accepts card payments and the people at the reception are receptive to most needs. There is nothing outside this place in terms of tourist attraction or even great hotels, but that is something that did not bother us much. 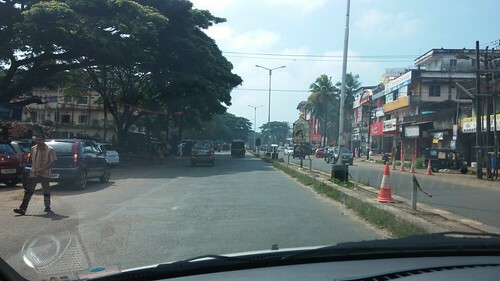 The journey back to Bangalore can be by a direct train from Kanhangad station via Mangalore or by road via Coorg, or by air via road to Mangalore and air to Bangalore. 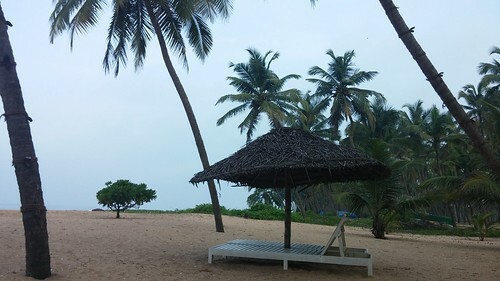 So if you are planning an outing to a sea front resort, with direct train from Bangalore, then the Malabar Beach front resort and spa is a good place to visit. You can either plan a two day visit or even a one day visit - neither will disappoint you. Does the Celerio really offer what it claims?